I haven’t been able to update this blog..! Here are some calligraphy pieces I did recently. 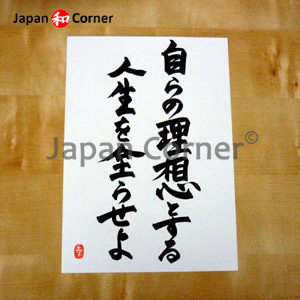 It says “Live the life you have dreamed” and it is done on A4 size (210mm x 297mm / 8.3″ x 11.7″) white card. I used Japanese sumi ink and a calligraphy brush. Just let me know what you’d like on your piece, and I won’t charge you anything extra for translating the phrase/words you’d like 🙂 An A4 size piece will cost £8.99 plus P&P and and A3 size piece will cost £13.99 plus P&P. (Same price for any number of letters.) I will wrap your piece in a clear plastic sleeve and send it in a hardback envelope by Royal Mail First Class. 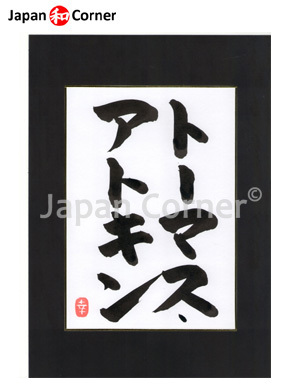 Original Japanese calligraphy piece will make an excellent gift!